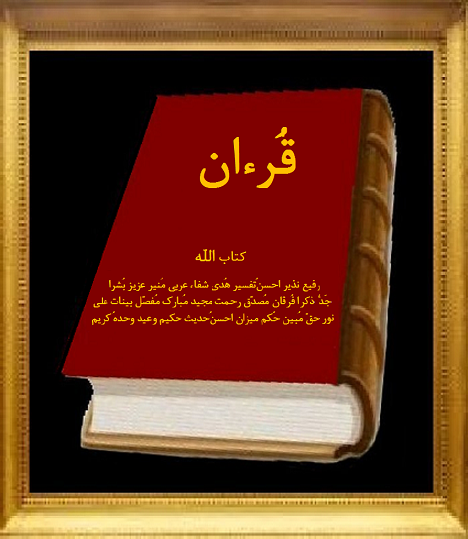 Dear Readers, I have translated Dr. Khalifa's English translation of the Quran into a Farsi language by his authorization, and I have printed the Farsi Quran in 1995 by the will of Allah, the Hakim. Then on May 19, 2006 I was guided by the Almighty Allah, that we should not translate the Arabic Quran into other languages for other people. Because Allah sent the Quran in an Arabic language in order for us to use our brains. That means, Allah wants us to translate the Arabic Quran for our own, because Allah wants to teach us, and reveal to us His Arabic Quran, instead of using translator's given knowledge. So, I have repented to Allah, and asked Him for His forgiveness. I am very sorry that I have been misleading so many E-rawnians, and caused them to fall in to the unforgivable sin, which is idol worship. Therefore, if one studies any translation of the Arabic Quran, that means, he or she is following from another Quran, besides Allah's only Arabic Quran. And that would be considered as a "Shirk" or idol worship. And that would be an unforgettable sin, as far as Allah's Arabic Quran is concerned. I hope it is not too late for you to repent, and ask Allah for His forgiveness, so you could go back to Allah, the Hakim. By the will of the Almighty, Creator, The Hakim, I was supposed to translate the Quran into the Farsi language as a test for all of us, because Allah wanted me to be the first one, who has repented to Allah for translating His Ghor-on. Thank Allah, The Hakim. With the will of Allah, The Almighty, on the 27th blessed night of blessed month of Ramadan of the year 13 B.H. (610 A.D.), Prophet Mohammad's soul was taken up by the Holy Spirit together with angles. He was taken from the Sacred Mosque in Mecca to the Farthest Mosque in the Highest Horizon as the stars were falling away. Allah came down as close to Mohammad as two bows length or closer, then Allah placed the blessed Arabic Quran into Mohammad's heart as one revelation while he was looking at Allah. Later on, over a period of 23 years, with the will of Allah, The Almighty, the "Arabic Quran" was being recited to him through angel Gabriel's mediation, according to the event of his time, and also he was giving special instructions as to which revelation goes where in the Quran, after revelations completed. And Muhammad wrote down the Arabic Quran in the order which he was receiving, with his own hand. After departure of Allah's final prophet, Muhammad, peace be upon him (27:59) the scribes who wanted to copy the Arabic Quran and take it to different countries; they added 2 false ayats (verses) at the end of sura (chapter) 9, in order to idolize the prophet. This horrendous crime caused a 50-year war between idol worshippers and Submitters. Finally Umayyad rulers burned the original "Arabic Quran", written by Muhammad's hand in order to avoid any future disputes. Ever since, the whole world was deprived from the original "Arabic Quran". We have not sent any messenger or prophet before you, that when messenger wishes something, satan would not threw something in his wishes. Then Allah would nullify what satan has been thrown at him. Then, Allah establishes His ayats (verses) and Allah is the all knowledgeable and the all Hakim. In order to setup what satan threw as a test for those who have disease in their heart and their hearts are hardened. And the ones who have been given knowledge will recognize the truth from your Lord, then they believe in it and their hearts become humble to it. And Allah guides the believers to the right path. Please read these ayats carefully and make sure you understand it. We will make you recite it, so do not forget. Except, what Allah wills, indeed He knows what is declared and what is hidden. Please verify the Arabic ayats yourself. This ayat is from the 8th sura revealed to Muhammad. Please pay attention as Allah willed Dr. Khalifa completely FORGOT the word "ILLA", meaning "EXCEPT" and he changed the meaning of this ayat by his wrong translation (87:7). You may check other translations or ask any Arabian children they would tell you the correct meaning of this ayat. Allah's plan fulfilled. Allah be Glorified. That means Allah permits His messengers to forget something from the Quran and that would be inevitable. And also satan makes us to forget as well (6:68 ; 12:42). No matter how careful messenger would be, Allah will make him forget, and messenger would not even recognize it. When messenger forgets some ayats in the Arabic Quran, it is totally Quranic, and it wouldn't be any negative points on his account, because that would be a test for others. As we read in (48:2) "For Allah will forgive all your past sins as well as your future ones and has completed His blessings upon you and will guide you to the straight path". Allah forgives His messenger's sins. But, not for his contemporaries. We do not have any excuses. Because, forgetfulness of the messengers and prophets are in accordance with the will of Allah, and it is inevitable, and it is written in the Arabic Quran, and it would be a test for us. As Allah says In (22:54) Allah will give knowledge to some of us, therefore some of us would recognize the truth from our Lord, then we would believe in it, and our hearts become humble to it. That means Allah is going to save some us. What interfered with Dr. Khalifa's wishes was that although, Allah says Arabic Quran, but he changed the Arabic Quran to an English language Quran. Peace be upon Rashad Khalifa (27:59). Allah created him with an excellent moral character, and made him one of the known scientists in his era. 1- At the time of prophet Muhammad the Arabic language was not the common language of Mecca. And an Arabic script was only 100 years old. That is why they siad, . . .bring down a book for us so we can read it (17:93). This also shows that Muhammad knew at least 2 languages. Arabic language, and common language of the Mecca. Those who did not hope to meet us said, bring a Quran other than this one, or change it, or turn it to our language. Allah told him, say, I can not turn it, or change it according to what my soul inspires to me. I only follow what is revealed to me (the Arabic Quran). Indeed I am afraid if I disobey my Lord, the retribution of a great day (10:15). Please verify the Arabic ayat yourself. He was saying that I can not turn this Arabic Quran in to your language, simply because what drops on my mind. I fear Allah, if I disobey my Lord. Just like in our era, for example in United States the common language is an English language, and because the common laguge is not an Arabic, then is this right to go ahead and just translate the Arabic Quran to an English Quran? This is the same wording of those people who did not have hope to meet Allah. Therefore, a believing person would not say such a thing, and he or she would study the Quran in Arabic language. Allah says, we made the Quran easy to learn, does any of you wants to learn? (sura 54). It only takes few weeks for a person to learn the basics of the Arabic language from internet, and then there are vocabularies which can be found again on internet. Here is a site that would teach you Arabic language in 10 days. Remember that you do not want to speak Arabic, and do not want to write a book in Arabic language, you just want to find out what are these ayats of the Arabic Quran talking about. And that would make it much easier. You may start by learning one sura per month. Most of us went to school and college and spent years to study the certain languages for certain professions, in order to feed ourselves and put some clothes on. Don't you want to spent only few weeks on learning the Arabic language, and learn the book which grantees your happiness, and it will bring you total security for ever? Remember, ( illiteracy ) -= -( blindness ). Allah willing we would not go back to Allah blind. This is how one could be misled easily. Please verify the Arabic ayats yourself. In (10:15) Allah the Almighty is informing us that if you turn the Arabic Quran in to another language, you have disobeyed Allah, and fear the retribution of a great day. 2- There are few ayats in the Arabic Quran that Allah refers to an Arabic Quran. Allah wants us to use our itellect and brain that He gave us, and learn the Arabic Quran, an He promised us that He would teach us the Arabic Quran. so we would not depend on a translation that someone ells inspired by. The Arabic Quran is Allah's creation, and we should not put it aside. We do not want to idolize someone else's inspiration beside Allah's Arabic Quran. But, unfortunately that is what we have done so far. (12:2; 16:103; 20:113; 26:195; 39:28; 41:3,44; 42:7; 43:3; 46:12) These are the 10 ayats which Dr. Khalifa was supposed to forget, and so he did. The reason was, that he was always reading the Arabic Quran himself. And we thus sent it down as an Arabic law, and if you ever follow their wishes, after what has come to you from knowledge, you do not have Allah as an ally nor a protector (13:37). If We made it a Farsi Quran, they would have said, why did its ayats not explained in detail? What? Persian (book) and an Arabian (messenger)? Say, for those who believe, it is a guide and healing. And those who do not believe, there is deafness in their ears, and for them is blindness. They are being called from a far away place (41:44). These are undeniable ayats, and they are the firm ayats of the Arabic Quran, and they are the essence of the scripture. They are not allegorical ayats. Do you not wonder why Allah put these ayats in the Arabic Quran? If some one put aside the Arabic Quran, and only studies Quranic translations, not even he or she has disobeyed Allah, but that person has also disrespected the Holy Spirit, and also has disrespected porphet Muhammad as well. And these are not small sins. Please verify all those Arabic ayats yourself. This is very simple, Allah asked us to use our intellect and study His Arabic Quran, in order to get rewarded. Now if you study an English Quran or Farsi Ghor-on, why then should you be rewarded? You are doing something that ALLAH DID NOT ask you to do! In (8:2) we read, Indeed the believers are those whose hearts tremble when Allah is mentioned, and when His revelations are recited to them, their faith increases, and they totally depend on their Lord. 3- In (35:29) We read, Indeed those who recite Allah's book, and observe the contact prayers, and they spend from what we have porvided them secretly and publicly , they hope for an investment that never loses. Now let me ask you this, if someone asks you, "What is the book ok of Allah?" What would be your answer? I am sure you are not going to say, "Dr. Kalifa's English translation of the Quran." Yet, you would show them the Arabic Quran. Why don't you Google "Quran"? All you Will see would be the Arabic texts of the Quran, or the books of Arabic Quran. The ones who read Allah's Book, are the ones who know that Allah's Book was send down in an Arabic language. They know about those 10 ayats mentioned above. But, again there are those who read the books of mediators, or translators, instead of Book of Allah, and they say we read their translations, becasue they are closer to Allah! Woe to them and their investments! This is a very important aweyeh. Allah is telling us that the ones who read from The Book of Allah, the Arabic Quran, and observe their salat prayers 5 times a day, and pay 10% zacut charity, which has not mentioned in the Arabic Quran, but Allah repeated many times for "Bani Esra Eal", meaning, "The sons will be transported by Allah", "The Nation of Ebrahim", in their scriptures, Toeraat, and Engeal. Off course, if you are not stupid enough as in (2:130) and follow from "The Millat Ebrahim", then you will be among the winners. Otherwise, you will be a looser. They are the ones whom they would not be losers in their investments. 4- Dr. Khalifa was the one whom by Allah's will, took out 2 false ayats from the Arabic Quran and purified the Arabic Quran, but because of forgetting those ayats above, and satan's inevitable interference in his wishes, he added 6234 English ayats besides Allah's Arabic Quran. The reason was that Allah wanted to test us. We read in the same ayat (22:53), In order to setup what satan threw as a test for those who have disease in their hearts and their hearts are hardened. After prophet Muhammad's departure, scribes added 2 ayats to the Arabic Quran, and as a result there was a 50 year war, and many people got killed. But, now 6234 English ayats have been added to the Arabic Quran, and no one has said anything!?.... May Allah forgive us. 5- Allah says, we send down to you the scripture truthfully (4:105). But, the translations are full of mistakes and falsehood. 7- Allah says, If we revealed this Ghor-on to a mountain, you would see it humbly crushed down, because of fear of Allah. This is an example for those who reflect (59:21). This ayat is saying, that the mountain as a submitter knows the awesomeness of Allah's Arabic Quran, and it knows that if the Arabic Quran reveals to it, it is going to crash it down. But, if you reveal an English Quran to a mountain, it would only laugh at you. . . . That is why if all the jinns and humans band together, they can not possibly bring an Arabic Quran like this (17:88). Are we smarter than all the jinns and humans? Please verify the Arabic ayat yourself. 8- We have given you the seven pairs and the great Ghor-on (15:87). Do you think translations of the English Quran or Farsi Quran or any other languages are as Great as the Arabic Quran? Do they have seven pairs in them? Allah says, the Arabic Quran contains Healing and Blessing (17:82), there is Guidance in the Quran (2:185 and 17:9). Quran is Great (15:87). Quran is Honorable (56:77). Quran is Glorious (50:1). Quran is full of Hikmah (36:2), Is the bearer of good news (41:4), makes covenant with us (41:4). The Arabic Quran is Mighty (41:41). There is Light in the Arabic Quran (7:157). These attributes are only belonging to the Arabic Quran, not in any translation of the Quran. The Arabic Quran has Allah's light in it (5:15). 9- Allah says, follow what is revealed to you from your Lord, and do not follow any idols besides Him. Rarely do you take heed (7:3). And what did Allah sent down to us? The Arabic Quran, and it has been repeated for us10 times in the Arabic Quran. Allah says, do not follow any idols besides Him, and we have absolutely disregarded that! Please verify the Arabic ayat yourself. 10- In (4:82) we read, why do they not reflect on the Quran? If it were from other than Allah, they would have indeed found many variations in it. If you look at few translations, you would find out so many different varieties of wordings in translating only one ayat. The reason is, because they are not from Allah. Then, why do you idolize Quranic translations? Allah's word never changes. 11- Arabic Quran, without any deviance that they may protect themselves (39:28). But, you would find deviance in all the translations and without a doubt it is inevitable. Why? Because, they are not from the creator of the skies and the land, and it is just from a human being, who is a creature of haste and weakness and . . . .
12- The revelation of the book where in there is no doubt, from the Lord of the universes (32:2). But, all the Quranic translations are full of doubt. Please verify the Arabic ayat yourself. 13- For about 22 years Dr. Khalifa spent hour's everyday on translating the Arabic Quran to an English language. He left 3 Quranic translations. Because, after each translation he would receive new information that was not in the last one, then he had to come up with a new translation. The reason was that satan made him forget those 10 ayats, which they were saying, Quran came down in Arabic language in order for you to use your intellect. You can not imagine how much hardship he went through, because of his tireless hard work for translating the Arabic Quran. It was all just to please Allah and striving in the cause of Allah of course. Peace be upon him (27:59). And also Allah wanted to test his followers. One early morning in 1989 he called me and said that Allah wanted you to translate the Quran to the Farsi language. That news made me extremely happy and excited, I was given a small job in Allah's kingdom, thank Allah!. . .And I had to follow his orders. For 16 years days and nights I was working on Quran translations, any chance I would get. I was working on the Quran, 18 or 19 hours a day. I took away all the time and money from my family in order to translate the Quran in to the Farsi language. I was striving in the cause of Allah, I thought so!. . . In 1995 Farsi Quran published, and if that was not enough, I continued on translating Dr. Fazely's translation. . . Until, on May 19th, 2006, I was then guided by Allah, the all Great, that Arabic Quran should not be translated. Thank Allah, I stop working on translation and I wrote down and announced it on my old website, and I also wrote down that I would not reprint the Farsi Quran. Later on I repented to Allah, and I asked Allah for His forgiveness. Then the ones who wanted the Farsi Quran to be reprinted asked me for the original copy of Farsi Quran (2002) and I gave it to them willingly. Then, right after they reprinted the Farsi Quran they inflicted with a big disaster, which I found out later on! (DR. Atef Khalifa, Rashad's brother, who was handeling the reprint of the Farsi translation, died of prostate cancer few months after, and he was a surgeon himself.) When I was translatiing Dr. Fazely's English translation to Farsi language, I was also helping him on his translation, as far as proofreadings and corrections (300 pages of e-mails from 2001 to 2004). I must tell you that on those days I was going through the worst time of my life, and I did not know why I was going through so much unhappiness!? Now I know, that The Almighty Allah was showing me sings, that I should stop what I was doing. Please Allah forgive me for misleading your people by translating the Quran in to a Farsi language. We did not send down this Quran to you in order to cause you any hardship, except as a reminder for those who fear (20:2). Sobhan Allah! Just imagine how much hardship and hard work one would go through all those years for translations. Please remember everything was in accordance with the will of Allah. Please verify this Arabic ayat yourself. Muhammad went through lots of hardship and fighting and killing the disbelievers at his time. But, regarding the Arabic Ghor-on Allah told him, "We did not sent you this Ghor-on to casue you any hardship, just tell the people. It is noteworthy that so far, those who call themselves submitters, not only they have not submited to the will of Allah, but majority of us have misled by reading an English Ghor-on or Farsi Ghor-on or any other translations, and we have been deviated from Allah's straight path. It is true that we have turned away from idolizing Muhammad and saints and clergymen, but instead, we have started to idolizing the Quranic translations and we turned away from Allah's Arabic Ghor-on, which is fully detail book. You would not know just how many people praised me and idolized me just because; I translated the Ghor-on in to the Farsi language. Dr. Khalifa wrote down on his last translation, "Ghor-on, the final testament, Authorized English Version with the Arabic text." He was destined to do that in order to fulfill Ghor-onic ayats (22:52-54)(87:6,7)(10:15). This was exactly what satan worked on extremely hard for the past 21 years, and so far he has been victorious. satan wants to deviate us from Allah's revelation. May Allah curse satan the rejected devil. Just imagine, all those years Dr. Khalifa could have helped us to learn Arabic language, instead of going through so much hardship. . . ! But, Allah, the all Hakim, had a different plan. Important: As The Arabic Ghor-on mentions, Moses was sent by Allah in order to take Children of Israel out of Egypt, and to deliver the Torah. Shoayb was sent by Allah in order to establish the measurements and weights so people would not cheat. Jesus was sent in order to deliver the Engeel (Bible). And Allah put the Arabic Ghor-on in to Muhammad's heart in order for him to deliver it to us. The most logical Quranic questions for Dr. Khalifa. Question: Dr. Khalifa, what was your mission from Allah? Answer: I was sent to deliver the mathematical signs in the Arabic Ghor-on, base on number 19, in order to prove the authenticity of the Arabic Ghor-on among all the Scriptures. Q: Why did you then brought an English Ghor-on? Allah emphasized 10 times in the Arabic Ghor-on that Ghor-on was sent down in an Arabic language. Allah said in the Arabic Ghor-on that "We MADE the Ghor-on in an Arabic language". Q: Dr. Khalifa, why did you MAKE an English Ghor-on out of the Arabic Ghor-on? Muhammad already brought down the Arabic Ghor-on. Did you think people would understand it better if you translate it? Isn't Allah Who Teaches the Arabic Ghor-on? Q: Now if you thought that would help people, then why didn't you translate it in all other languages in the world? Among all those people in the world you wanted to help only English speaking people? Didn't you think that if Allah wanted, He could have sent the Ghor-on to each and every different languages in the world? Yet, Allah wanted each person Only learn the Arabic Ghor-on in order to get Healing, and receive Guidance. There is some kind of power or some kind of waves in the Arabic Ghor-on that brings Healings and Guidance for us which we just do not know about it now. That is why Allah called the Arabic Ghor-on "Azim". Do you now understand that why Allah sent the Ghor-on in an Arabic language? Q: Did Allah revealed to you an English Ghor-on through the Holy Spirit, as it was revealed to Prophet Muhammad? Q: Dr. Khalifa, you were supposed to confirm other messengers, and you were supposed to follow the Om-mee messenger, Muhammad, whom he was following Ebrahim himself, then why didn't you? Q: Dr. Khalifa, Did you know that after your departure, your followers put the Arabic Ghor-on in a freezer and they only followed your "English Translation" thinking that it was from Allah? Did you know that caused them to be frozen in time! Just like ayat 43:5 says, they casued the message to slip away from them! As we all know there was no Gospel of E-saw until about 200 years after Jesus departure!?. It seems like some people destroyed some part of the Enjeal, especially the part has to do with E-saw's birth and death, and it was hidden for 200 years or so, then who ever put it back together 200 years later, or Translated it, he changed and distorted the original Scripture drastically. And that occurred around 300 years prior to the revelation of the Arabic Ghor-on. Do you know why those who call themselves "Christians" believe that E-saw was son of god, instead of son of Maryam, and he was a Lord, and they didn't consider him as a human being, and that he did not have any wife and children, and that he had some kind of supernatural power, and he could heal people by his own power, he had a power to revive the dead people, and they believe that he was killed and crucified, and that he shed his blood for people, yet they believe that he is alive on earth right now! And they also think that E-saw would come back and save his people? The reason that they believe the way they do, is that it Appeared to Translators that way, and then Translators injected to people's heart, that is why they do not have any knowledge and they only conjecture. That is why it has been about 1400 years that Allah has been warning people of the book, who call themselves "Nasrany", Helpers, or as today they call themselves "Christians", that the part of the Gospel of E-saw is totally distorted and it is absolutely lies attributed to Allah. That was the result of human Translators and satan together. The reason most of so called Christians who fell in idolizing E-saw is because of the Translators. Translators Cursed, Stoned and Condemned the Gospel of E-saw by Translating it. That is why this specific part does not match with the words of Allah in Torah and Psalms of Dawood and the Arabic Ghor-on! Because, these Scriptures are all totally against Idolizing a human being besides Allah. And as you know we do not have any proof regarding the authenticity of the Enjeal. And having so many versions of the Enjeal, proves this fact to all of us as well. Translators! STOP Translating Allah's Scriptures. Leave these people alone, let them find out themselves. Translators! Do Not act as teacher of the Ghor-on, Let Allah Teaches His people! Same thing happened to the Ghor-on. Translators cursed and stoned the Arabic Ghor-on so much; therefore, as a result we have so many religions and sects. If you search through out Internet, you would find thousands of Masjids that each and every one of them is different with one another. Why? The reason is that Translators and Leaders are misleading their own people by their own personal interpretations of the Arabic Ghor-on. Translators just do not believe that there is no compulsion in religion! They just want to inject their own religion to the people! People! Stop idolizing Translators, Allah will teach you the Arabic Ghor-on, Allah is the only Teacher of the Arabic Ghor-on! 14- Allah has revealed the Arabic Ghor-on with His own knowledge. And the angels witnessed as well, but Allah suffices as witness (4:166). And the Ghor-on translators also brought Ghor-onic translations with their own knowledge, and we were all witnessed. Please verify the Arabic ayat yourself. 15- After Muhammad's departure, his contemporaries new that they should not translate the Ghor-on, because they have read those 10 ayats, otherwise, they could have simply translated the Arabic Ghor-on in to different languages, and then, they would have sent it to different countries. But, instead they have concurred the neighboring countries whom they were just bunch of Idole worshipping people, and then they turn their languages to an Arabic language, in order for those countries to understand the Arabic language, so they could study the Arabic Ghor-on. One example was Ruzbeh Farsi, known as Salmon Farsi, who was an Erawnian man and he was one of Muhammad's contemporaries, and there are some ayats in the Ghor-on referring to him. He could have translated the Arabic Ghor-on in to the Farsi language, but, he did not. As we read in history books that he was asked to translate the sura Al-Fataha for them in Farsi language, but he did not, because Al-Fataha is part of the Arabic Ghor-on. If we made it a Farsi (Persian) Ghor-on, they would have said, why did its ayats not explained in detail? What? Persian (book) and an Arabian (messenger)? Say, for those who believe, it is a guide and healing. And those who do not believe, there is deafness in their ears, and for them is blindness. They are being called from a far away place (41:44). Please verify this Arabic ayat yourself. Dr. Khalifa translated this phrase, What? Persian (book) and an Arabian (messenger)? as to, 'Whether it is Arabic or none-Arabic' there is no such a thing in this ayat . . .! 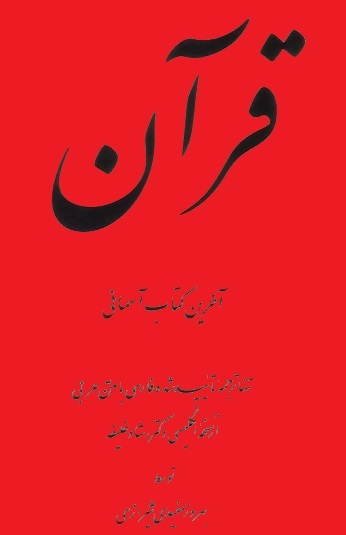 It is saying, ("Is this one Persian?" and "That one Arabian?") Please look at other people's translations or ask any Arab third or forth grader at school as well. This phrase is simply questioning, "What? Or what is going on? Persian? and Arabian? Also remember the word "Say" came after [ What? Persian and an Arabian? ] not before that, because this is very important. This is how he was supposed to misled us, but our job is to verify each ayats ourselves. First of all Allah is the teacher of the Arabic Ghor-on, not the teacher of English or Farsi Ghor-on. Second Dr. Khalifa should not have had to translate the Artabic Ghor-on, and also I was not supposed to translate his Ghor-on to the Farsi language. We are responsible for our own neck, may Allah forgives me. This is how his contemporaries were misled for all these years, and they were all wasted their times by reading the Ghor-on in different language rather than in an Arabic language. Now if you look up the word "Aajamee" in the most famous Arabic dictionary, Al-Munjid, it would say, "Farsi language people", or Erawnians. But, because Arabs did not want any other countries to be involve in the Arabic Ghor-on, through the years they tried to nullify it. That is why through recent history they have been trying to discredit "Salmon Farsi" completely. That is why in recent years Ruzbeh Farsi was not given any credit at all, although there are few ayats in the Ghor-on specifically referring to him. This is a consequence of following the translations blindly. Allah willing we would not go back to Allah as a blind person. Remember (14:21) says, ( . . whether we complain or resort to patience, . . .) but not in (41:44), this is very important. Prophet Muhammad came with the Arabic book and he spoke in the tongue of his people. If a prophet comes with a scripture other than the language of his own people, then people would have been in shock, and they would have said, what! Erawnian (scripture), and an Arab (messenger)? But, Muhammad came with the Arabic Ghor-on to an Arabian community, "Omieen". Allah is telling us that a prophet messenger will bring a scripture in the same language of the prophet messenger. And also that prophet messenger will go to a community that their language is the same language as the messenger and the scripture that he would bring would be in the same language. But, first of all a messenger should not come up with any scripture, and messenger's native language does not have to be the same language of his community, that is only for prophets. This is the different between messenger and a prophet. A believer would go ahead and learn the language of the scripture and then he or she would find Healing, and Guidance in the Ghor-on. Just like Ruzbeh Farsi, known as Salmon Fasri, an Iranian man, he was one of prophet Muhammad's contemporaries. He learned the Arabic language so he could became a believer. Remember, prophet Muhammad DID NOT translate the Arabic Ghor-on for him in to Fasri language, and Ruzbeh did not translate the Arabic Ghor-on in to Farsi language either. . . ! Only the ones who do not believe, avoid learning the scripture's language, and those are the ones who have deafness in their ears, and that is why they are blind. Therefore, each person should learn Arabic language, and we should not follow some one ell's inspiration. One of the early teachings we have learned from the Ghor-on was the different between a prophet and a messenger. We learned that prophet would bring a scripture and messenger only confirms it. Do you not remember? What has happened was totally against the Ghor-on. Messengers Do Not bring scriptures. Please verify the Arabic ayats yourself. As far as this ayat concerns, one can ask this question; what? An Egyptian messenger, and an English Ghor-on? Wait a Minute . . !! . . Stop . . ! . . Stop . . ! ----Hold On . . ! . . . . Just Wait . . ! Ask Yourselves . . . .? What Piece of Scientifically, Untouched Information Do We Have From Allah, Which Is Absolutely Truth? Think . . ? ----------The Arabic Ghor-on . . . . . . Ok . . !. . . Ok . . ! . . Good . . ! Now . . . . . Think Please . . ? Who Is The Most Ardent Enemy Of Us In This World?. . . Think . . ! ------------satan . . ! . -------------Excellent . . ! . . Excellent . . ! he Wants To Take Us With him To The Hell Fire….. Therefore, Fight your Enemy (satan). . . . . . And Save Yourselves . . . .
16- The all Gracious, Teacher of the Quran (55:2). The knowledge in the Arabic Ghor-on called "Hikmah". You would not find any school or universities that teach you Hikmah. There is no end to Hikmah. Every time you read the Arabic Ghor-on, if you are a sincere person and you are with those who want to cleanse themselves and purify themselves, Motahharin, in accordance with Allah's scripture, then you would find a new knowledge in it, which is called Hikmah or Hikmat. Allah is the only One Who reveals this Hikmah to us. But, if you read the Ghor-on in different languages, you would only receive few of this Hikmahs, and they are the ones which was dropped on to the translator's mind. Even If you study the translations 1000 times, you would not find any new information in them. You be the judge of that, go ahead and find out how much more information you can get out of the Ghor-onic translations, after you read it few times? This is the different between the Arabic Ghor-on and translations of the Ghor-on. Please think about it, Muhammad and his contemporaries were reading the Arabic Ghor-on few hours every night for 23 years, and they could never receive all the Hikmahs in the Ghor-on. Please verify the Arabic ayats yourself. 17- If we revealed this to some Persians (Farsi speaking people), and had him recite it (the Arabic Ghor-on) to them, they could not believe in it. We thus inserted in to the heart of guilty people (26:198-200). But, some of the Persians knew Arabic language, like Ruzbeh Farsi known as Salmon Farsi, therefore he could truly believe in it. This ayat is saying, that you do not want to be like those who do not know the Arabic language, so go ahead and learn the Arabic language. satan made almost all of the translators of the Arabic Ghor-on to ignore the word "some" in order to make them translate the Arabic Ghor-on. Allah be Glorified! Please verify the Arabic ayats yourself. Fight your most ardent enemy (satan) in this life. 18- The 3rd sura revealed to Muhammad says, . . .Read the Quran every night, half of it, or 2/3rd of it, or 1/3rd of it, or when ever you can, stay awake and read the Arabic Quran (73:20). Now remember at that time it is only 3 short suras was revealed to Muhammad (73:20). Allah wants us to read the Arabic Ghor-on constantly, the same Ghor-on which Muhammad was reading. Our daily contact prayers are only 5 times per day, and it will only takes about 17 or 18 minutes. But, half of the night is equal to 6 hours. That means, if it is possible read the Arabic Ghr-on 6 hours per night. O you who believe, are you doing the same thing? If you ask the ones who call themselves "Muslim" or "Muzlim" that, why do you not follow what Muhammad was following himself, the Arabic Ghor-on? They would answer you back; we follow "Hadith" and "Sunna" besides the Arabic Ghor-on as well. Then, ask our submitters that why do you not follow what Muhammad was following, the Arabic Ghor-on? You would answer; we follow the Ghor-onic translations instead of Arabic Ghor-on! Another word, the name of "Hadith and Sunna" in our time changed to "Ghor-onic Translations"! Do you not think that after Muhammad satan came up with "Hadith and Sunna" and in our time satan came up with "Ghor-onic Translations"? satan just DOES NOT want us to study the Arabic Ghor-on. 19- Surely, the One Who made the Arabic Ghor-on obligatory for you, will definitely take you back to the returning point. Say my Lord knows who comes with guidance, and who is in clear straying (28:85). That means we are obligated to read the Arabic Ghor-on. Therefore, submitting to Allah, it is not just observing the contact prayers, paying obligatory charity, and fasting in the month of Ramadan. In (2:177) we read, Righteousness is not turning your face towards the east and the west. Righteous are those who believe in Allah, the last day, the angels, the scriptures, and the prophets and . . . some people think that the religion of submission is just observing the contact prayers and turning to the east and the west, and they do not want to be bothered with the rest of the religious duties. It says that if you consider yourself as a righteous believer, you must study the Arabic Ghor-on, which Allah has revealed it for us, and made it an obligation for us. This ayat was revealed in which scripture? It was revealed in the Arabic Ghor-on, neither in an English Ghor-on nor in Farsi Ghor-on. Then, how could one put aside the Arabic Ghor-on and stops reading it, then says, "I do believe in the Ghor-on"? Yet, this person should say," I do believe in translations!" It is just like this ayat (62:5), The example of those who carried the Torah, then they did not uphold it, is like the example of a donkey carrying books. Miserable indeed is the example of people who rejected Allah's ayats. Allah will not guide the wicked people. Do not carry a book, without not knowing what is in it! Fight your most ardent enemy (satan)! All the Rabies before becoming a Rabi, they must go to Israel in order to learn Hebrew language, so they can understand Torah. The reason is that they respect the language of the Torah. Priests must learn Latin language as well. If you want to take a course in Archeology in Sorbonne University in France, you must learn German language first. In Chemistry you must know what H2O means. In computer science you must know the Machine language, in Medicine you must know the Medical terms in Latin. In Electronics a technical writer must know technical writing language. In music you must know the language of Music. Can you translate Beethoven's Fifth Symphony? Your answer is "yes" only If you know the language of music. Can you translate the singing of the birds……But, the only thing we have learned was to translate Allah's Arabic Ghor-on, because we just do not want to learn Arabic language. It is ashamed… Remember, (iliteracy) = (blindness). Allah willing we would not go back to Allah blind. Fight your most ardent enemy in this world. May Allah Help you. May Allah forgives me. I urge you brothers and sisters, please stop translating the Arabic Ghor-on for other people, like I was doing. And I urge you please stop reading the Ghor-onic translations, like I was doing. Allah sent the Ghor-on in an Arabic language. The English language Ghor-on, and Farsi language Ghor-on, are not from Allah, it is only from the translators. Dear brothers and sisters, Allah is the all Gracious and the all Merciful, Allah is forgiver, acceptor of repentance, please listen to the call of Allah in the Arabic Ghor-on. Within these last moments, the Most Gracious and the Most Merciful is giving us another respite. (47:7) O you who believe, If you help Allah, Allah would help you. The awesome discovery of scientifically mathematical signs in the Arabic Ghor-on purified the Arabic Ghor-on from any distortions and proved that the Arabic Ghor-on is the only untouched message of Allah to humanity. Now, for he first time in history, after 1400 years, the "Arabic Ghor-on" with corrected number of suras and ayats and corrected spelling and the name of the suras is now avaiable in this website. This website was built in the casue of Allah, it does not have any copy protections therefore, please download the Arabic Ghor-on and print it, so you may use your intellect and translate it for yourselves. Please pay attension: The order of revelations to prophet Muhammad was different than the Ghor-on that we see today. Muhammad was receiving the revelations from the Holy Spirit according to the event of his time. So when you read the Arabic Ghor-on in the order which it was revealed to prophet Muhammad, you would findout what they have been going through, and at the same time you would get Ghor-on's Hikmat as well. Holy Spirit was instructing him as to where he should place the suras in the Ghor-on, after revelations were completed. As Allah says in the Arabic Ghor-on, We have arranged it, what an arrangement. So, both arrangments are perfect, becasue they are from Allah. Only one of many reasons for this arrangement that we have today was, because we were supposed to witness the awesome mathematical signs in the Arabic Ghor-on in our era. If they would not have destroyed the Arabic Ghor-on written by Muhammad's hand, today we would have had both arrangements, and one could have studied both of them. It is an awesome blessing from the Almighty Allah that for the first time in history, after 1400 years, now on this website, both forms are avaiable. Please download them.